Before going into the final race of this year's Euro JK 18 season, Nayan Chatterjee and Karthik Tharani were tied for points. However, Chatterjee's unfortunate retirement in the last race paved the way for Tharani to take home the championship title. The JKNRC 2018 witnessed a textbook season finale today at the Buddh International Circuit in Greater Noida. In the Euro JK 18 series, Karthik Tharani and Nayan Chatterjee had set the stage for the final race of the day as they both went into it tied for points, having 89 points each. The first race of the day saw some clean racing among the Euro JK 18 competitors with the Safety Car coming out on just one occasion. Once again, the championship leaders Chatterjee and Tharani, who were just one point apart at the end of day one, took P1 and P2 in the first race of the day, respectively. 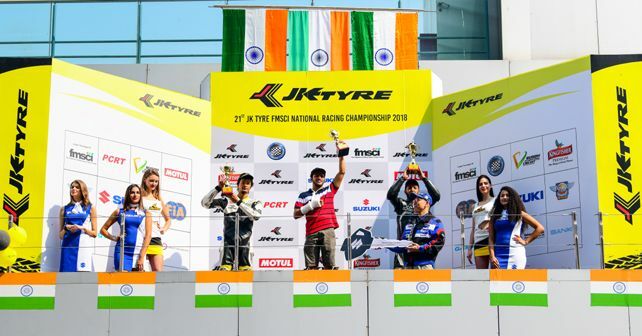 While Nayan had been leading the race from the start, Tharani had managed to overtake Yash Aradhya and Arya Singh on the penultimate lap to take the second spot. Arya Singh finished the race in third place, followed by Aradhya in P4. With 89 points each, Tharani and Chatterjee went into the title-deciding race tied for points. Things were going well for Chatterjee when out of nowhere on lap 2, Manav Sharma rear-ended Chatterjee which brought out the Safety Car. While Sharma was out of the race immediately, Chatterjee was forced to retire after making it to the pits, ending his hopes to win this year's championship. Taking full advantage, Tharani ended the 2018 season in style by taking the final race victory and clinching the overall championship title. While Tharani bagged a total of 97 points in the 2018 season, Chatterjee accumulated 89 points and Ashwin Datta managed to score a total of 86 championship points. In the Gixxer Cup, Joseph Matthew's crash on day one had ruled him out of the remaining round as he had suffered a broken arm. With the championship leader out of the race, the final race on day two ran cleanly, however, with a few DNFs. In the end, Malsawmdawngliana secured the win in the final race of the season, followed by Sachin Chaudhary finishing in P2 and Sanjeev Mhatre rounding off the top three. Clinton Cordeiro and Vidhan Dubey, who had secured podium finishes on day one, were both handed a 10-second post-race penalty for a jump start. Despite being ruled out of the final round, Joseph Matthew took a comfortable championship victory with a total of 60 points. The first runner-up in the overall championship standings was Malsawmdawngliana with 47 points and Syed Muzammil Ali secured the final spot in the top three with a total of 41 points at the end of the 2018 season.